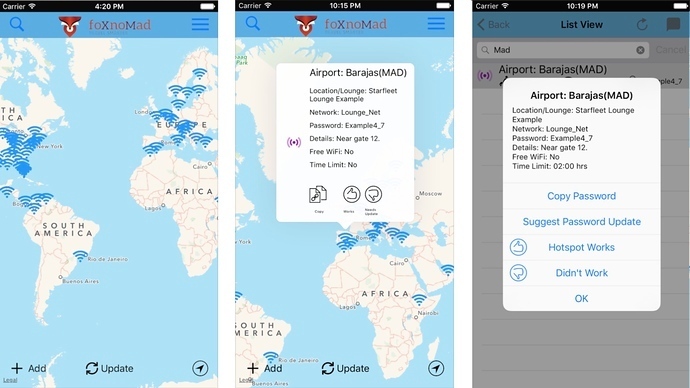 Available on iOS, WiFox is a continuously updated map of airport and lounge passwords from around the world available to travelers offline, so you can use it without an Internet connection. 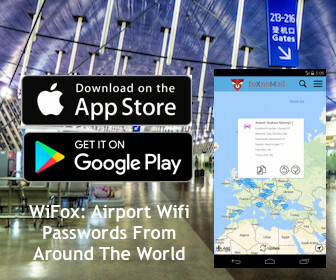 WiFox is based on my popular map of wireless passwords from around the world, letting users around the world add password information from airports as they travel. Passwords are then verified and added to the map, which is updated in real-time when you have an Internet connection. WiFox is updated with information travelers, pilots, and other users send through the WiFox app, foXnoMad website, and foXnoMad Facebook and Twitter accounts. WiFox currently has wireless Internet information for over 70 airports. WiFox also tells you if any wireless access points have time restrictions – if they do, WiFox shows you how to get around them! 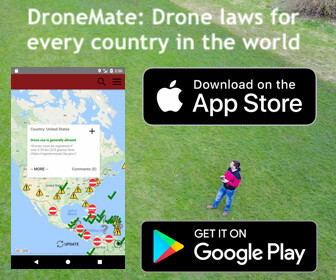 The map is updated automatically upon opening the app (when you have Internet access), by clicking the ‘Update’ button on the map, or the refresh icon on the List View. Copy Passwords Directly – Wifi icons on the worldwide map indicate if password information is available. You can find the lounge or terminal where wireless is available and copy the password directly from WiFox into your phone’s settings. Unlock Time Restrictions – Access points with time limits are also shown but WiFox shows you how to get around time-based restrictions. Updated In Real-Time – Travelers can rate password information, letting me know if it might need a update or send an updated password for verification directly through WiFox. Rating System Keeps Password Information Current – WiFox’s wifi icons are color coded to let you know how fresh and reliable a given access point’s password information is. WiFox is available on iOS devices (iPhone, iPad, and iPod) for $1.99 on the App Store. An Android version is in the works (I didn’t forget about you!) and I’ll make an announcement when it’s ready for release in a few weeks. Know that your feedback is an important part of WiFox, I would love to hear any feedback or feature requests you have for future updates. Ratings on the App Store are also important, so if you’re happy with WiFox, I would appreciate your 5-star ratings! I’m excited to announce foXnoMad’s first app, which I hope will help you travel smarter and get online for free in airports you might not be able to otherwise. Hi, I installed wifox in my iphone but it does not work, the app is not running. I installed wifox in my iphone, but it does not work. My IOS version is 10.0.2. I´ll apreciate your answer soon. I’ll be back to you right away. Can you please try opening the app in airplane mode, then when the app is open, turning on wifi. Hello I just installed the app on my iPad the application is not opening at all. our whole Family frequently changes between Android, Symbian, Windows and IPhone. Furthermore, as you kids always want the latest model and a cheap flat rate, we also change our SIM cards regularly. Do we have to buy the App several times, i.e. at least once every year? Do you check the information, when others update the app? Currently there is only an iOS and Android version of WiFox. You can use family sharing for Android, and you’ll only ever need to buy the app once for iOS (per Apple account) and Android. Updates are made to the map in real-time, for life. There are no ads, in-app purchases, or other costs other than the initial $2 for WiFox itself 🙂 Feel free to let me know if you have any other questions. There is an admin login page under about on IOS. What is that for? It currently has no user functions – but might be integrated with a few new features in a future release.